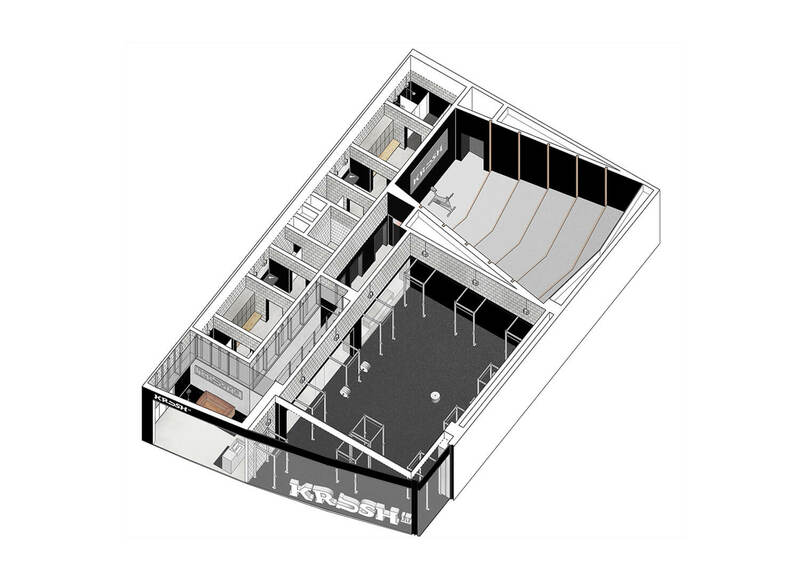 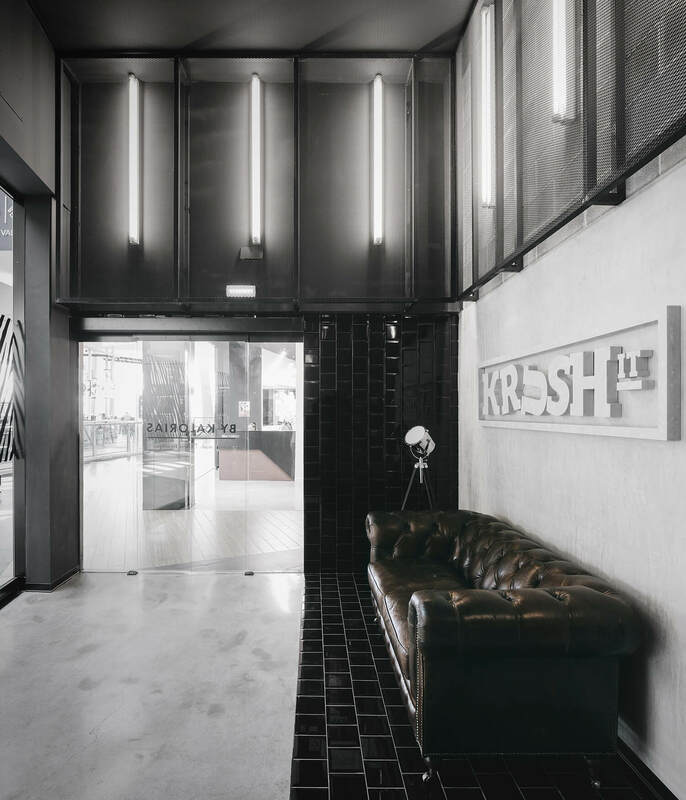 KRUSHit represents a venture on something unique and exclusive in Portugal Fitness panorama, a pay as you go gym with a clear focus on design and high intensity classes. 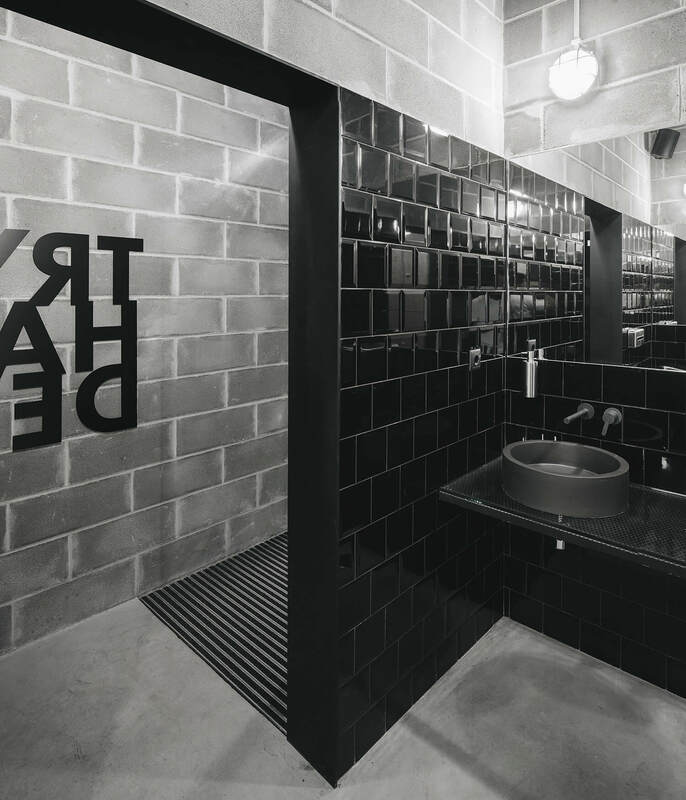 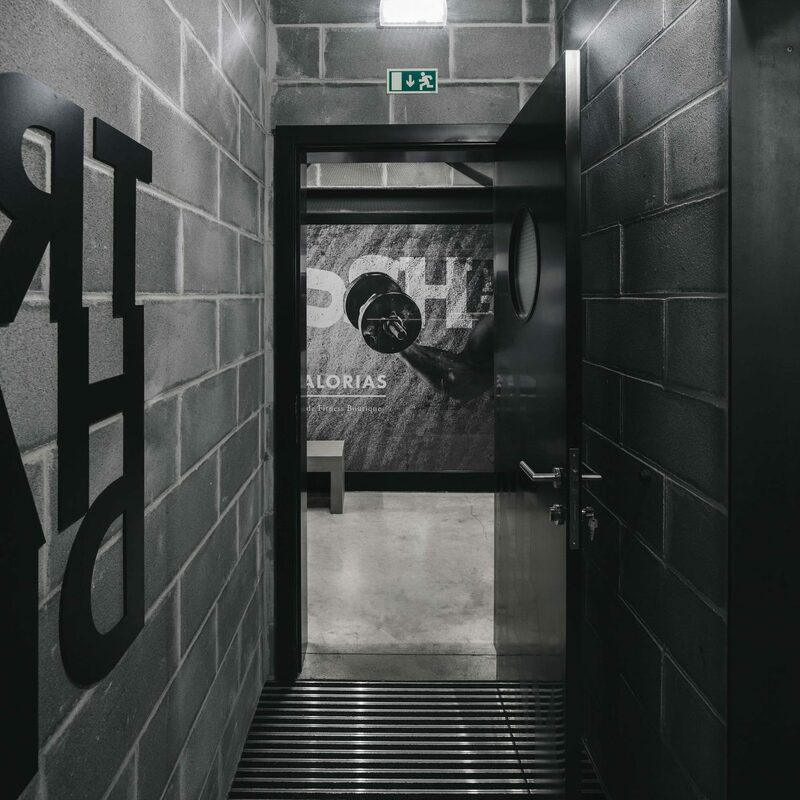 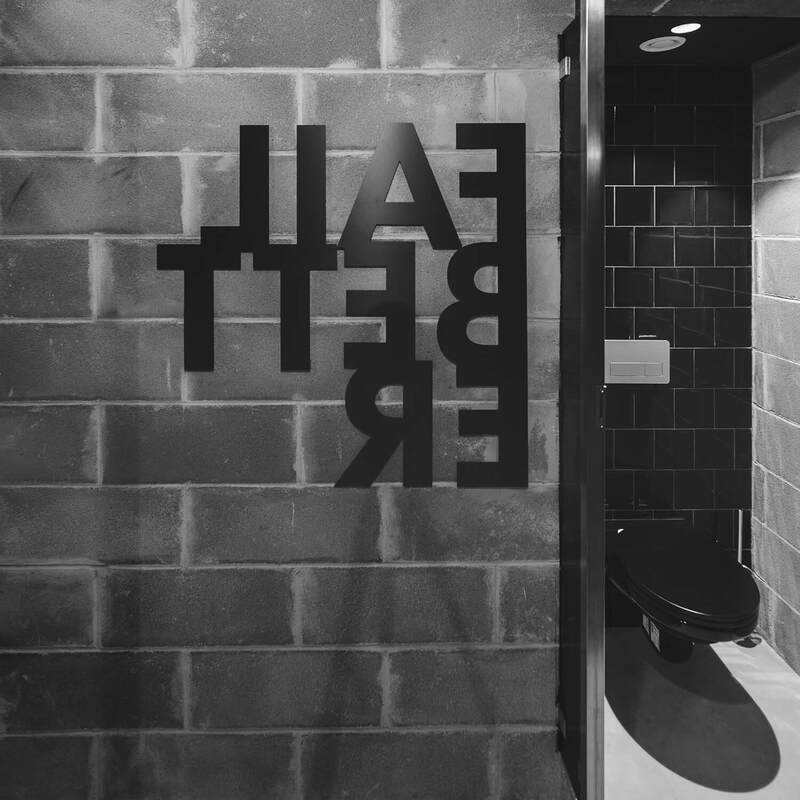 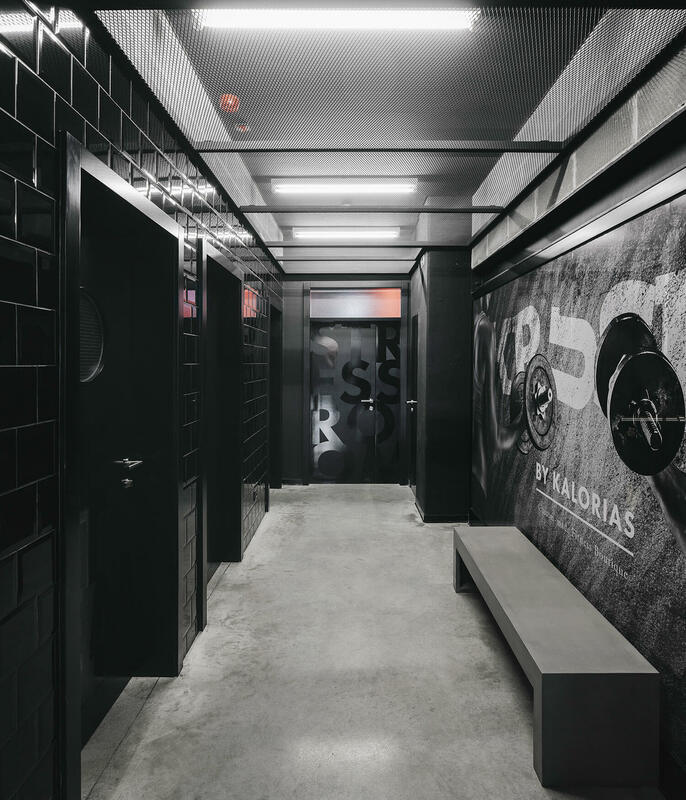 The developed image is intended to rip the usual patterns in the Portuguese gym industry, with a mystique and an addictive urban environment – the main idea was to create a private club atmosphere! 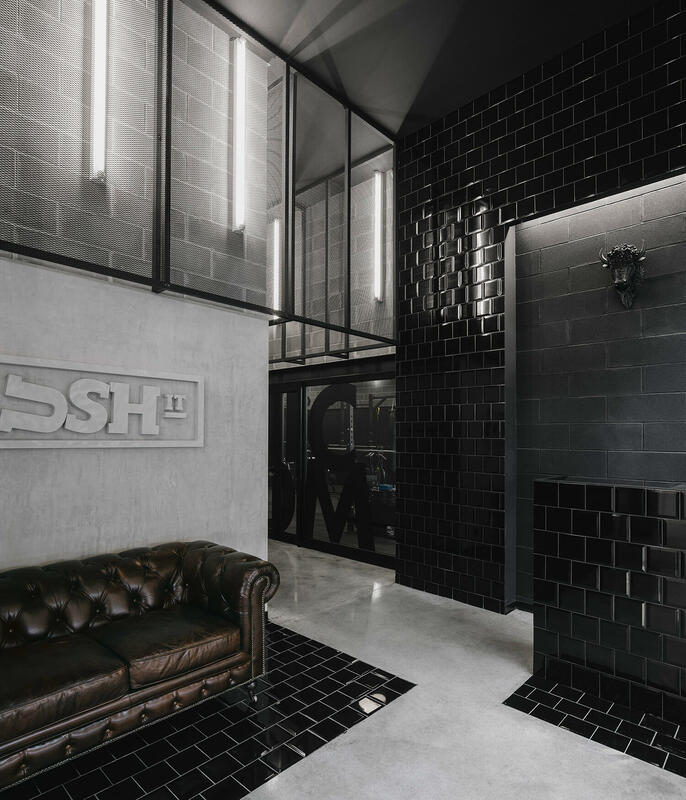 The inner image reflects an underground and disruptive design in result of a mixture of rough materials and imperfect surfaces, in contrast with details of luxury objects and shinning textures. 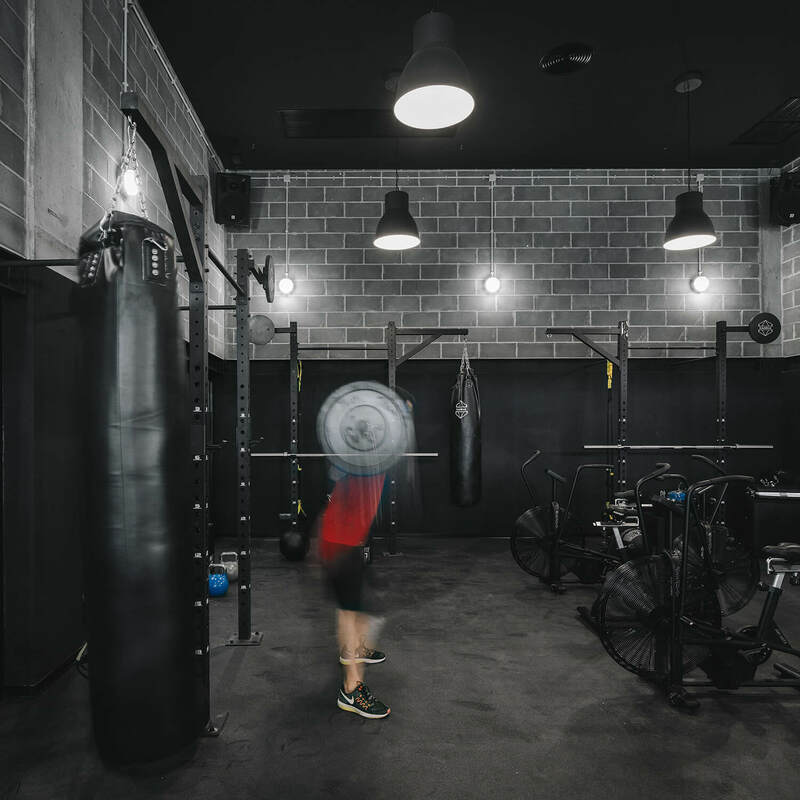 The training combined with the dark careful lighting environment transports us to an imaginary where our alter-ego can reveal its more warlike side. 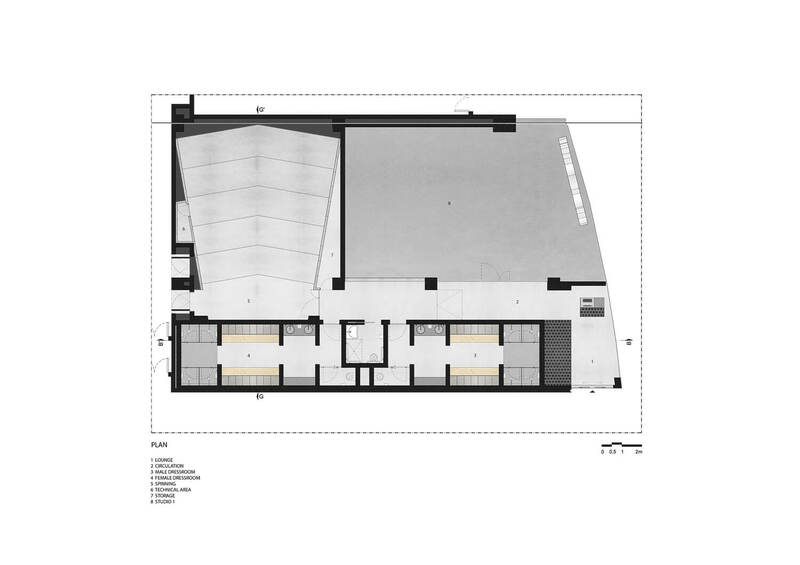 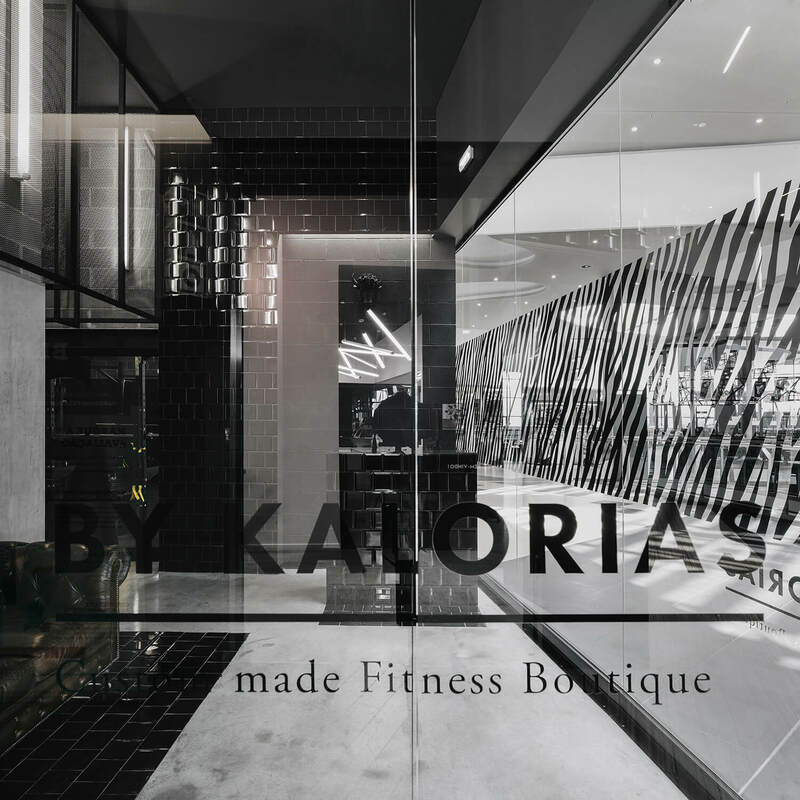 Functionally we were constrained to develop a layout within 290m² in an existing retail space to accommodate a dual studio fitness concept. 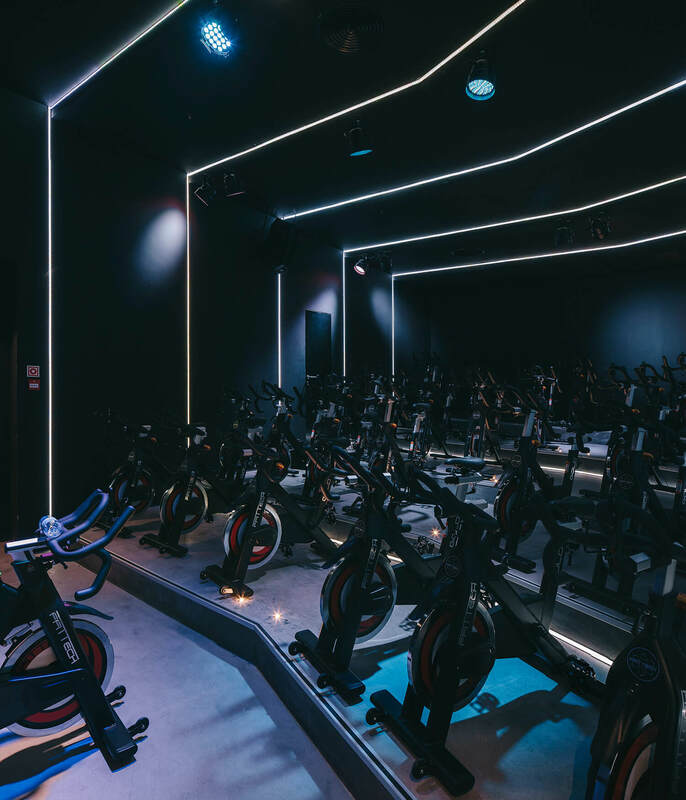 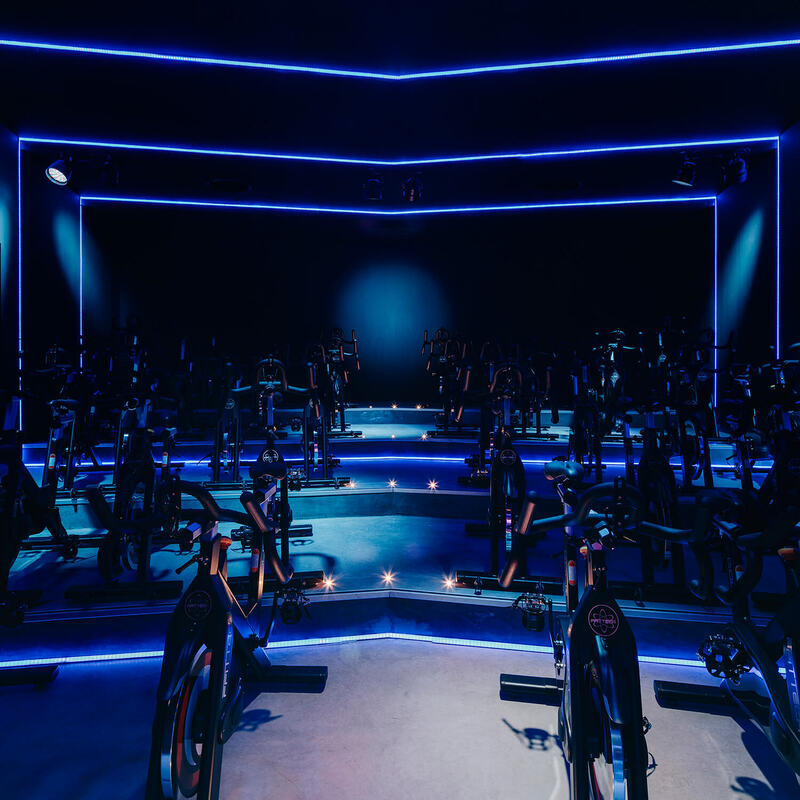 In each studio, there is one essential activity: functional training divided into several training stations in a single room, and a studio for Spinning classes with an amphitheater disposition, with loud music and flashy images. 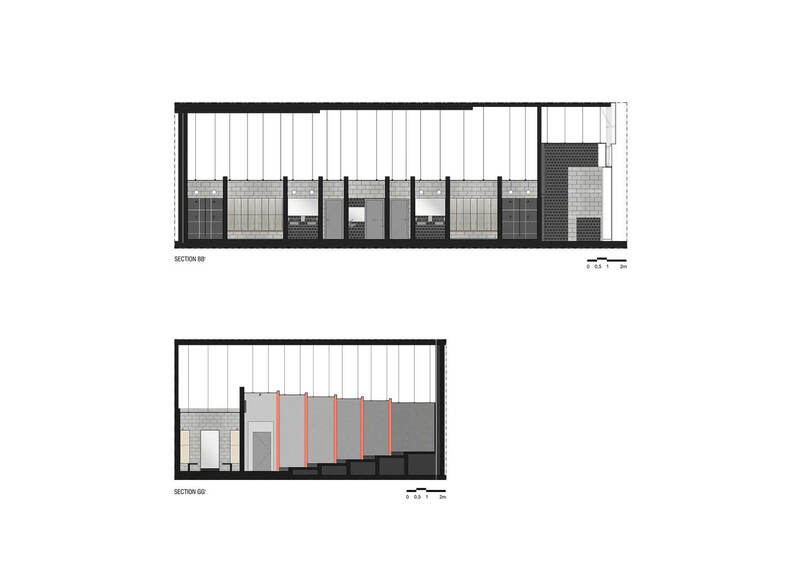 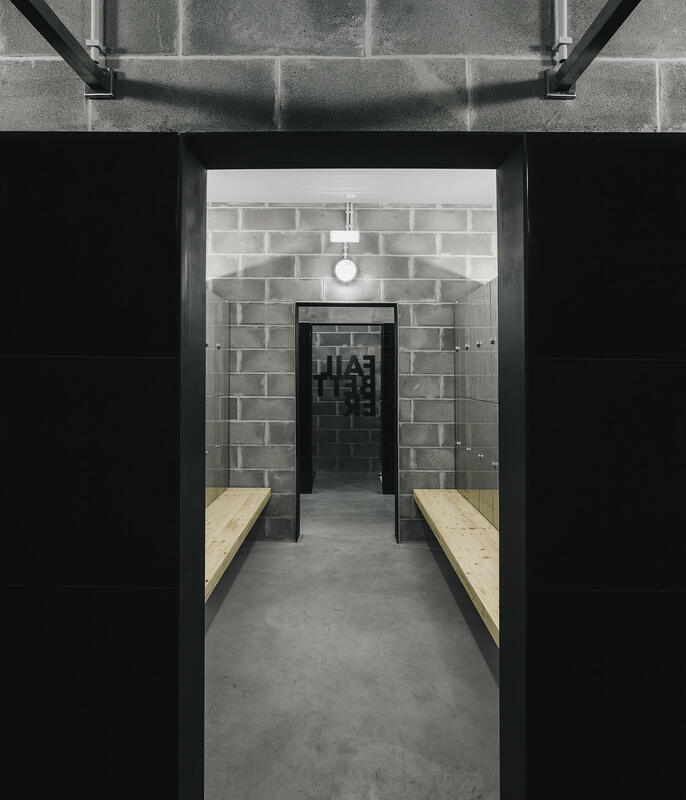 Moreover, the changing rooms, a sales corner and a lounge area define the other areas. 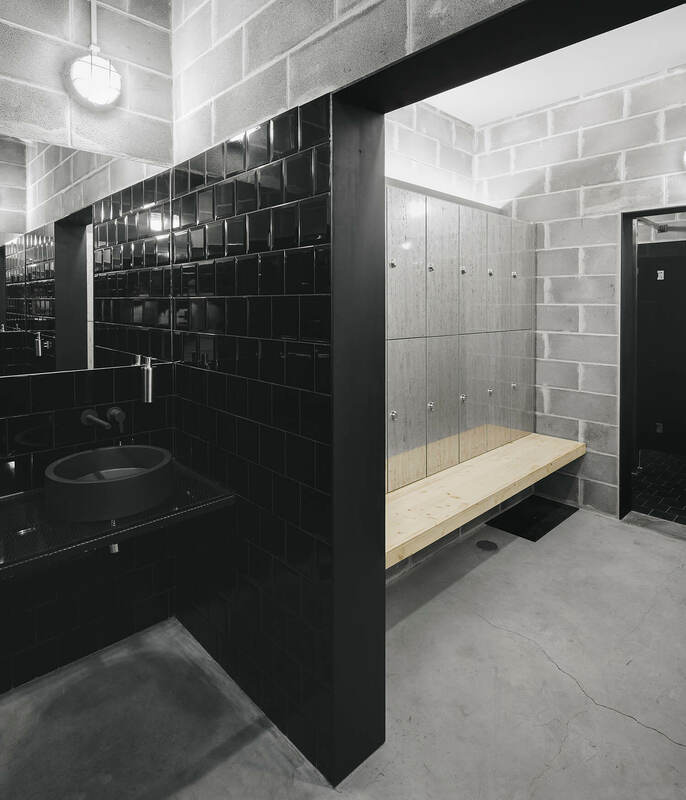 The materials were selected having in mind the creation of an appropriate scenario for sports practice! 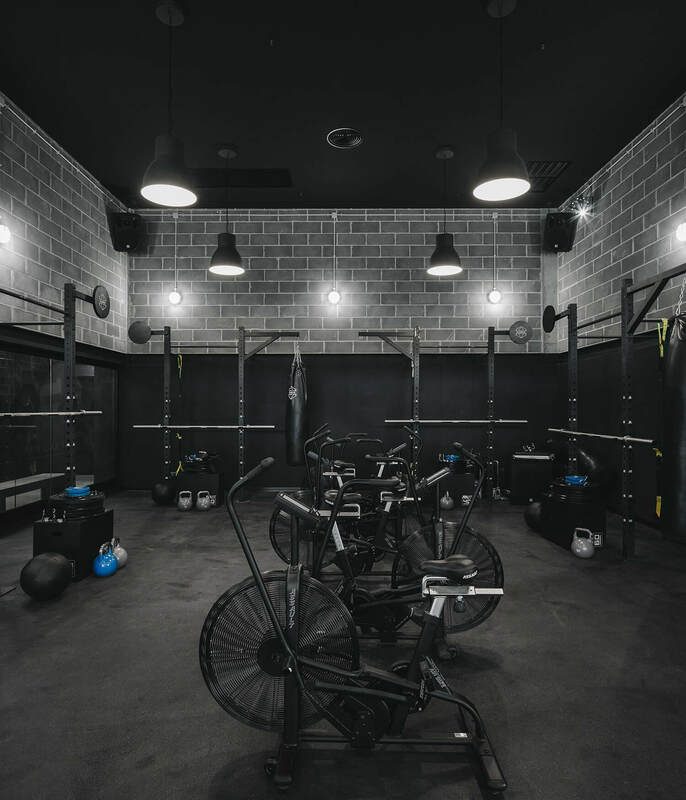 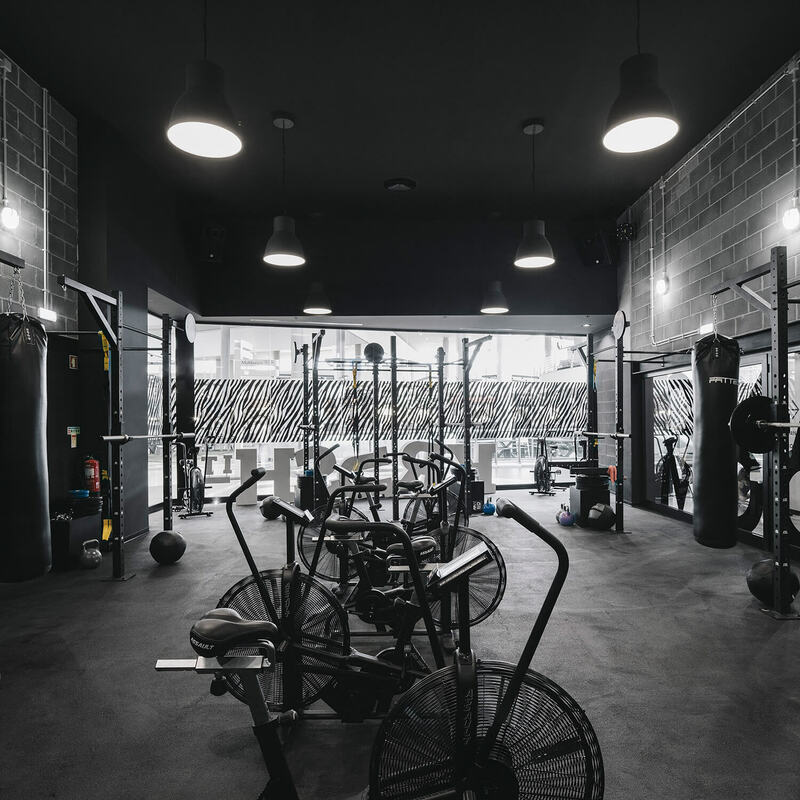 It was intended to take advantage of the construction building materials materiality – the exposed concrete blocks and the polish concrete floor, present practically in the entire gym. 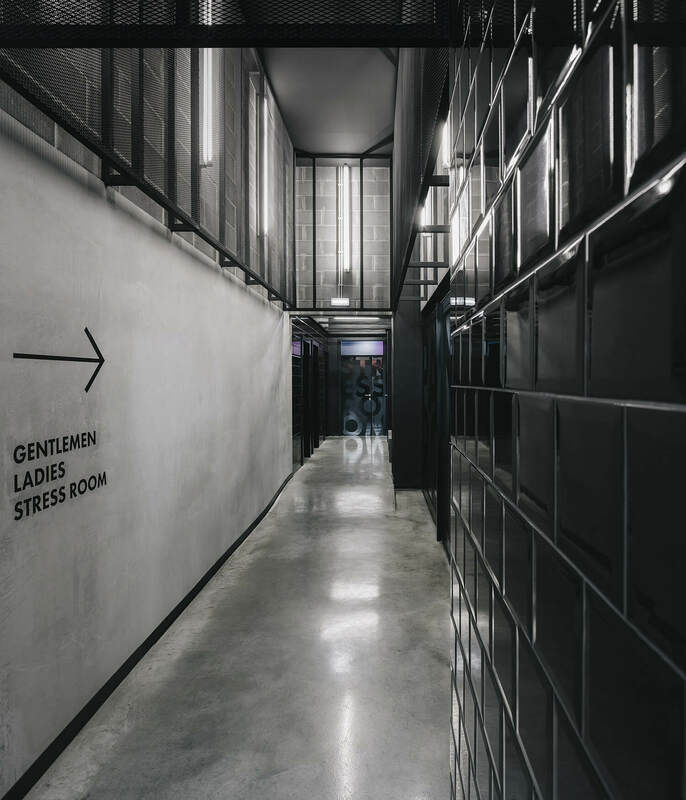 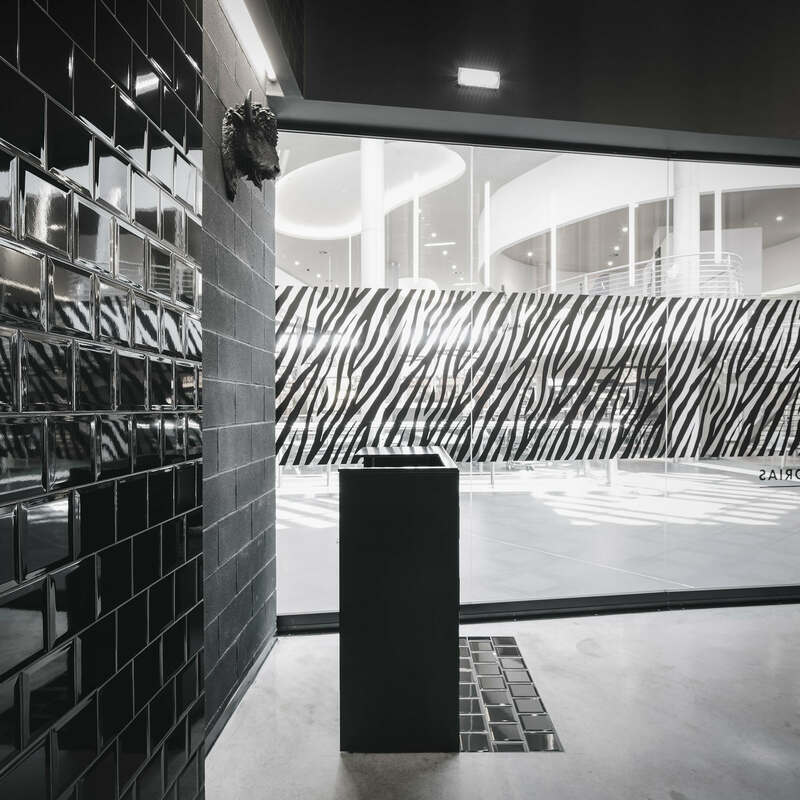 Combined with more elegant black beveled gloss tiles, both on the floor and walls, together with surfaces in metal grates placed in vertical black profiles frame the lighting system fixed to the walls, and so creating a minimalist and sophisticated atmosphere. 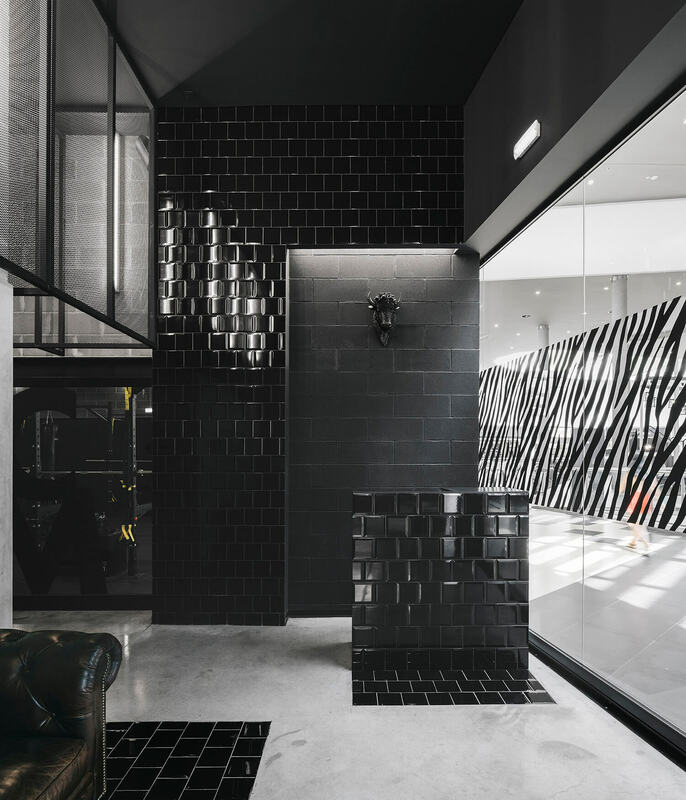 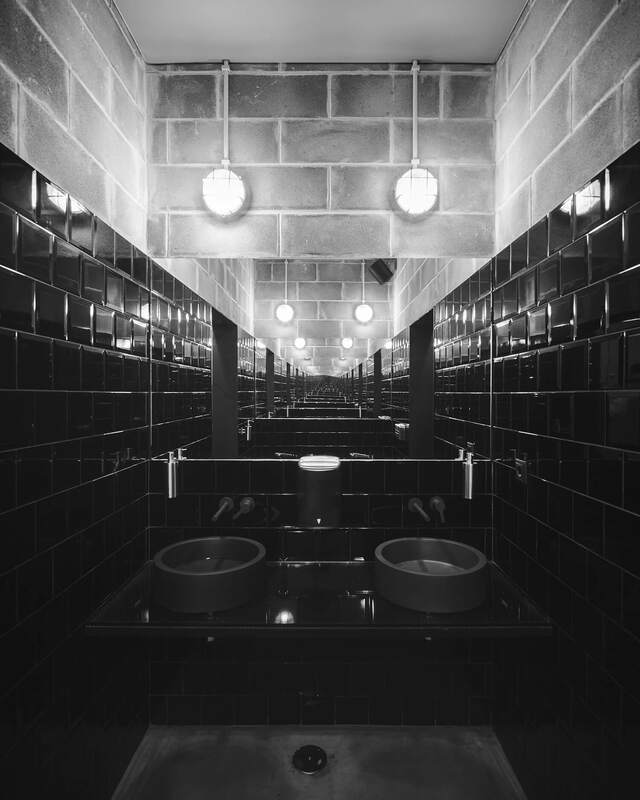 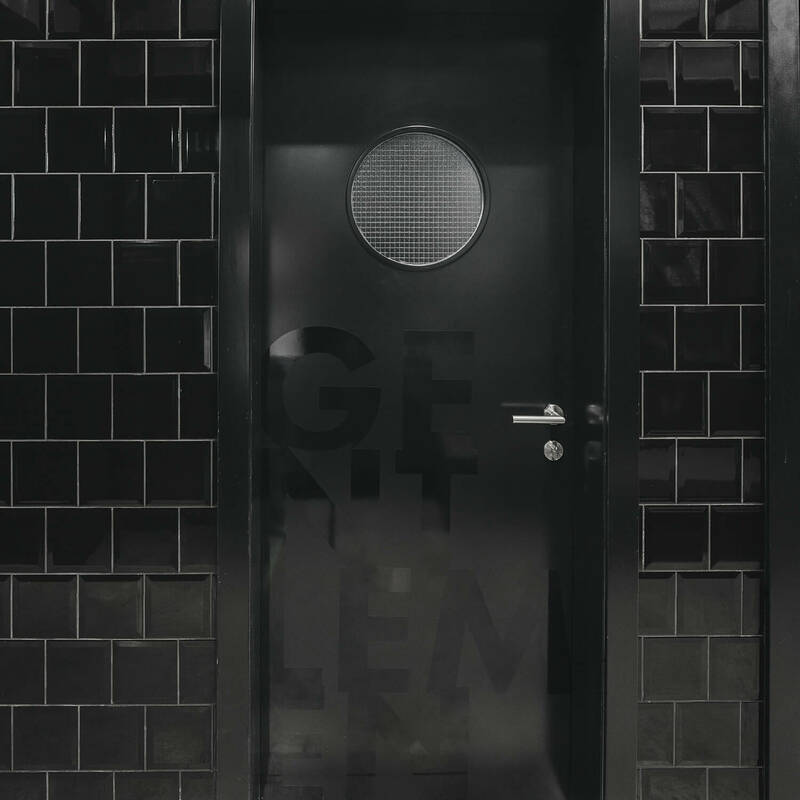 Overall, the chromatic palette runs through the different gray scales, combined with the applied materials natural color nuances, ending in absolute black elements, such as the tiles on the pavement and walls, lacquered glass, carpentry and metalwork. 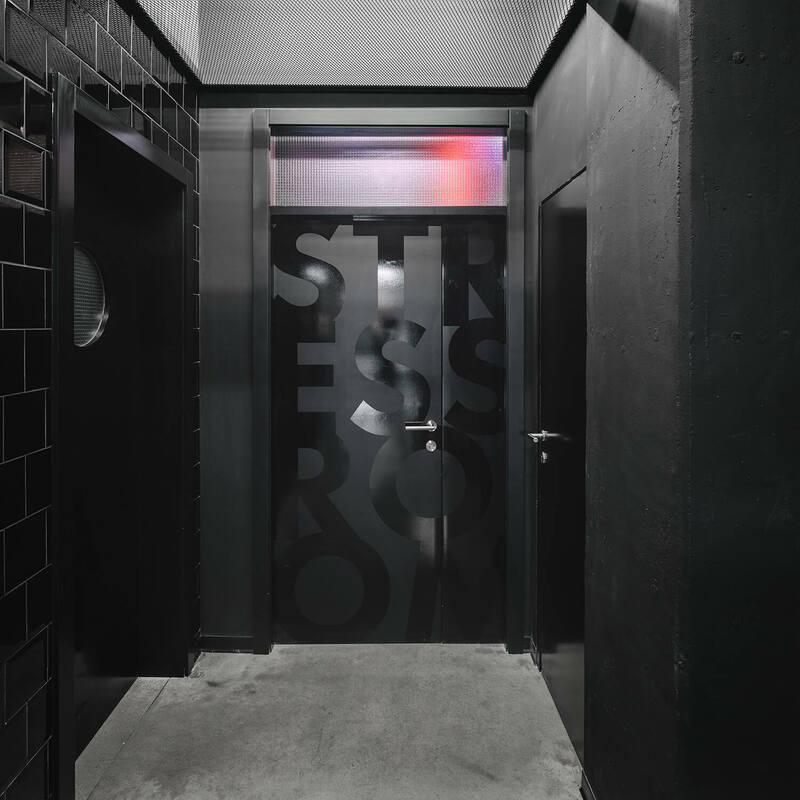 The rest of the decoration goes with the mood. 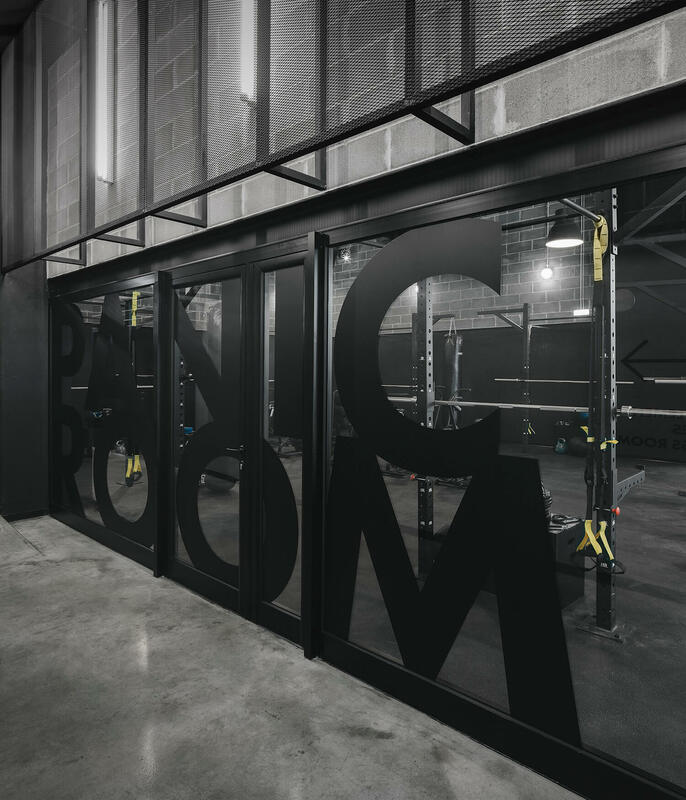 All elements combined create the perception of the expected training roughness and also the brand class and elegance.